When 10 new staff members joined the Digital Content Management (DCM) section last year, our unit more than doubled in size. 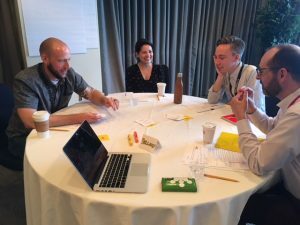 We were excited to expand the groundbreaking work done by our web archiving and digital collections colleagues, and we were energized by the Library’s strategic planning efforts that were underway at the time. As the Library charts a new path forward, we want to contribute to the newly defined goals and to the thoughtful process that generated them. To do so, we decided to define and commit to shared values for our work and work relationships by inviting input from all of our staff members in a value setting activity. In a two-hour session, our staff broke out into small groups for short activities and discussions. First, we sorted 50 cards labeled with value terms (and some blank cards, so we could propose additional terms) to narrow down a starting list; some terms that were very similar led to discussions about the nuances and helped us refine our thinking. Next, the same small groups brainstormed definition statements for the terms they had chosen, and wrote these rough drafts on poster boards around the room for others to consider. DCM staff members sort cards with different value terms. Photo by Trevor Owens. We then rotated to new groups and discussed how we might put our proposed values into practice in a few hypothetical scenarios. Inspired by the Society of American Archivists’ Core Values Statement and Code of Ethics, which states that we “are often subjected to competing claims and imperatives, and in certain situations particular values may pull in opposite directions,” each scenario described a situation that might challenge our values or pit one value against another. There were no right or wrong answers for this activity, and staff came up with multiple approaches to exhibit our values in each situation. Finally, to close the session, every staff member was asked to share an experience when a colleague outside of our section modeled one of our proposed values, so that we could all learn from those examples. We left the meeting with a list of proposed value terms and rough definitions, which the meeting organizers refined into a first version DCM Values statement. We attempted to be thorough but concise, so that the values could be easily recalled in our daily work. This was no easy task; in our effort to pare the list down, we tried to combine like-terms and sentiments. For example, some of the intention behind the proposed value of “safety” was incorporated into “care” and “trust” statements. We shared the draft version with all DCM staff members for their feedback and group approval to implement the statement. However, the value statement is intended to be a living and evolving document. After attending the Digital Library Federation Forum 2018, where inclusivity and safety were demonstrated by organizers, presenters, and attendees (check out their Code of Conduct), one DCM staff member again suggested adding “safety” to the DCM Values statement. We realized that we had not fully captured the importance of safety in our first version. The addition was discussed with all DCM staff, and the group agreed that it would be a great addition, not just as one of the values, but as an overarching objective of the entire document. We hope the value statement will continue to be discussed and evolve as our section does. We posted it in our digital collaboration space, so it can be shared with colleagues throughout the Library. We also recently created a print-able poster version, so that it can be displayed it in our shared meeting spaces. This will serve as reminder and reference during meetings, and help to integrate the values into our section’s culture as we further the important work of managing the Library’s digital content. These nine core values were collaboratively defined and developed by Digital Content Management Section staff. They articulate our shared commitments in our work and our relationships. All of the values work together, but safety is particularly essential as a foundation for enacting the rest of these values. They enable us to support each other and hold each other accountable. Care: We are maintainers and supporters of the collections, collection users, and each other. We care for the collections of the Library; and we create an environment that ensures the people who care for the collections, in the Section and partners inside and outside the Library, feel safe and supported. We model an ethic of care in all our interactions: to bring kindness, generosity, patience, and compassion to our work. Collaboration: We support the work of others, and our work is supported by others. We are open to the points of view of colleagues across the Library and respect their varied experiences and expertise. As one unit within a tightly coupled system, our success is dependent on the success of all of the Library’s units and staff. Craft: We apply the established professional principles and values of librarianship in our craft and resolve any friction or tension between them with discerning judgment anchored in reflective practice. We improve the craft of librarianship by building a community of practice inside the section, division, service unit, and institution committed to sharing and refining digital content management practices. Ingenuity: We continuously and creatively improve every aspect of our work and are always curious about new ways to do things. We establish and maintain flexible workflows, processes, and meetings. We take opportunities to course correct and allow ourselves the freedom to fail. We are adaptable and resourceful in order to scale up the Library’s ability to manage growth in collections and changes in their use. Learning: We are committed to continual learning and creating opportunities to learn together. We learn from others across the field and the Library and we share and teach others about what we have learned. We stay informed on current research and apply our learning to develop novel solutions. We are reflective and deliberate about distilling, synthesizing, and sharing what we learn in our work to improve digital content management methods. Safety: We are committed to establishing and maintaining a safe space to do our work. This is a foundational requirement to enable us to learn, collaborate, build trust, and hone our craft. We work to identify and mitigate potential sources of harm to each other, the organization, and the collections. We work to ensure that everyone can feel safe and supported in their work. Service: We serve staff across the Library who themselves serve the Library’s full range of audiences. We are consistent, responsible, supportive, and positive in all of our interactions. Sustainability: We ensure stable and enduring content, systems, practices, collaborations, and selves by maintaining balance. We plan our work and commitments to deliver results while allowing time to be mindful, thoughtful, and deliberate in our approaches and methods. We increase our personal, team, and institutional capacity while considering personal, organizational, fiscal, and environmental sustainability. Trust: We ensure both the trustworthiness of the Library’s collections and ourselves. We extend trust to others across the Library and build trust through achieving results. We provide dependable service to ensure enduring access to digital content. We respect and support each other and other units of the Library to exercise autonomy in accomplishing our shared mission. We are open and transparent about the work we do: we update partners equally about successes and setbacks. We strive to be trusted as experts and leaders on digital content management in the library, across the country, and around the world. This is a syndicated post. Read the original at The Signal 2019-02-19. ← The Unstoppable Rise of Sci-Hub: How does a new generation of researchers perceive Sci-Hub?